Very fine gage (40 ga.-003″) Type K thermocouple. 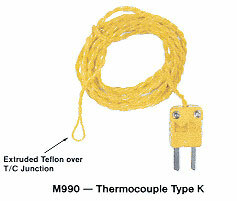 This teflon insulated exposed junction thermocouple is 36″ long and has a Marlin minature plug (1260-K) attached. The junction can be cemented or taped in place. Temperature range to 400ºF. Available only in Type K.
Totally teflon insulated Type K thermocouple of 24 ga. (.020) wire. For use in applications where acids or corrosives could otherwise attack exposed wire. For use to temperatures of 400º. Available in Type K only 60″ long. For fast resonse and accurate sensing of surface temperature these Marlin .005″ foil thermocouples (.015″ laminate) are easy to apply with their self adhesive laminate. For continuous duty temperature use of -50ºF (-45ºC)* to +400Fº (205ºC). 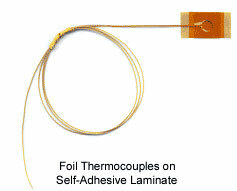 The thermocouple leads are 30 gage, teflon insulated 36″ long (other lengths available on request). Stocked for immediate deliver in packages of 5 thermocouples. *Must be applied initially at above 40ºF (4ºC).